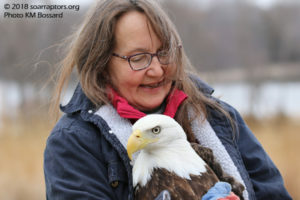 Kay holds the bald eagle rescued from near Farley, Iowa before release at the 2018 Earth Day Celebration at Swan Lake State Park. Does SOAR band birds prior to release? No, SOAR does not have a bird banding permit and does not band birds prior to release. SOAR has partnered in the past with other bird banding permit holders. How do bald eagles (and other raptors) fit back into their environment? Kay worries more about the non-migratory birds, especially owls. Before release, we look for a major travel corridor to make it easy for them to find a new territory / open space. River corridors are often used. Habitat is key. Birds that make giant movements she worries less about. With bald eagles released during nesting season and the potential for hatchlings in the nest, she tries to avoid known active nesting territory. Here is where we can use telemetry data to help us learn about the giant movements of some eagles. An adult bald eagle was admitted to SOAR on 9 July 2017 with a telemetry unit and band. This eagle was originally banded and fitted for a telemetry unit in Oklahoma, read her rehab story here, and is part of an Oklahoma Study with many of the same researchers as working on the Midwest Telemetry Study. Listen to this “In-Depth” Radio segment with Dr Bob Leonard from KNIA / KLRS Radio in Knoxville, Iowa as he talks with SOAR friend Marla, Kay Neumann, and Sara Schmuecker about the eagle release on 27 September 2017. Please note the info Sara shares about the importance of the telemetry research being conducted. “Oklahoma’s” telemetry unit was turned back on and started sending data on 28 September 2017. 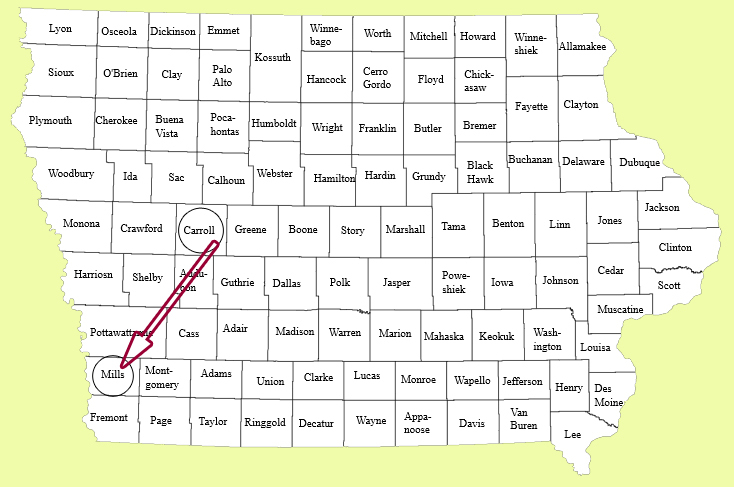 The map shows her position (mostly) at the end of each month. 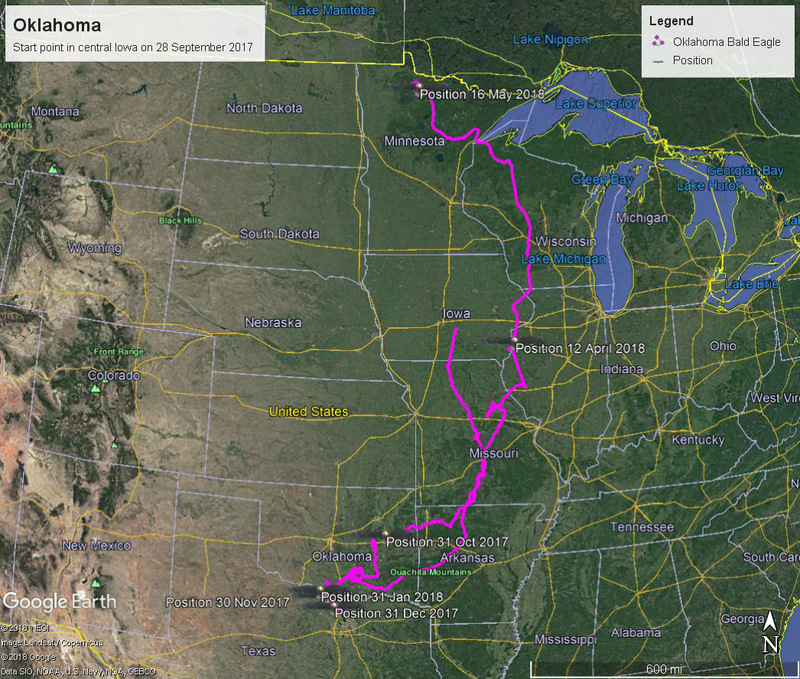 She went from central Iowa down through the Ozarks, to east-central Oklahoma, to the Oklahoma-Texas border, and then a huge shift northwards where in mid-April this eagle was on Benton Slough in the Mississippi River between Des Moines County, Iowa and Henderson County, Illinois. From there she headed to northern Minnesota. On 16 May 2018 she was NE of Waskish, MN and Upper Red Lake.